Documentation section contains information about the resources that make up HPC, as well as details about HPC´s operating system and special packages/software that have been used on HPC resources. This section also focuses on jobs computation on HPC, and also provides information on storage. All that information will be needed to create and run compute jobs on HPC-Cluster, as well as using NAS storage/space,and Licensed/Open source software that can be used only on HPC resources. We are using ROCKS 6.0 based on a customized distribution of Community Enterprise Operating System (CentOS). CentOS 6.0 Update 2 is a high-quality Linux distribution that gives HPC complete control of its open-source software packages and is fully customized to suit HPC research needs, without the need for license fees. CentOS is modified for minor bug fixes and desired localized behavior. Many desktop and clustering-related packages were also added to our CentOS installation. -l : list one file per line. -t : sort by modification time. -h : print sizes in human readable format. -a : list hidden files. du : estimates file space usage. df : report filesystem disk space usage. top : display Linux tasks. ps : report a snapshot of the current processes. ssh[node name] : used to login to the nodes. X : for X forwarding..
100TB of disk storage using a high-performance parallel file system, which is tuned for both large volume storage and fast access in a secure computing environment. The system supports large-scale and rapid data analytics. The disk system is backed by a tape archive and hierarchical storage management (HSM) system that adds an additional 100TB of storage capacity for long-term data preservation and backup. You can check available locations from clpc00, cluster1 and master nodes of clusters using df -h.
/scratch6, /c7scratch, /c8scratch and /c9scratch has been set up as scratch drive for submitting jobs to the respective clusters. /data9,/data10,/data11, /data12, /data13 are NAS storages of secondary backup. Please notice that /c5scratch /c5scratch1 /c6scratch & /c6scratch1 and /data3, /data4, /data5, /data6, /data7, /data8 had been removed and data were copied to /data14. /c$scratch is mounted in all the compute nodes of their respective Cluster, as well as /data$ is mounted in all master nodes along with clpc00 and cluster1. Note: Users are requested to not use /data14 for storage uses as it is being used as backup storage. if you need X (GUI : Graphical User Interface) then using. if you need GUI then using. (C7 cluster is a 80 nodes sequential cluster. Naming convention of compute nodes starts from compute-0-0 to compute-0-79. In which 50 are currently operational). For C7-cluster work area is /c7scratch. /c7scratch is mounted on clpc00, cluster1 and head nodes of all clusters and all the compute nodes of c7-cluster. If a directory for you does not exist on /c7scratch then you can create one for you. NAME can be replace by the name of your choice. In this cluster currently only a single queue (default) is specified; users need to submit job to this queue only. This queue is having 50 nodes configured; each node is having 8 cores cpu and 24GB memory. Intel Cluster Studio Version 2012.0.032 is installed in this cluster. Use below command in your .profile or .bash_profile to set path of Intel Cluster Studio permanently. Users submitting serial jobs need to set below variable in .profile or .bash_profile file. All users are requested to submit jobs through the batch queue. Any user submitting jobs directly on any cluster would invite action against it. To submit the job run below command. 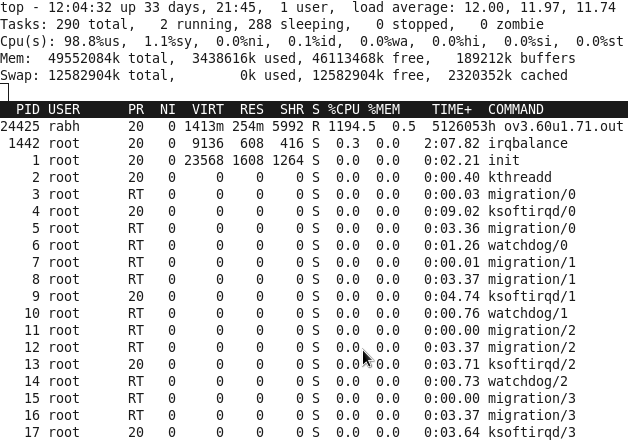 You can see running or queued job list by running below command. Node Status can be seen using pbsnodes command as mentioned below. If state=free then it means node is ready to accept the job. If it is showing state=job-exclusive that means node is busy with job. If is showing state=down or state=offline or state=unkown that means node is not ready to accept the job due to some problem. User can ssh respective node and use top for more appropriate output. Users can see queue status by running below command: (E represents that queue is enable and R represents that queue is running. Users can delete an unwanted job using below command and job id. If a user face problem in submitting the job he can try to find possible reason using below command. For C8-cluster work area is /c8scratch. /c8scratch is mounted on clpc00, cluster1 and head nodes of all clusters and all the compute nodes of c8-cluster. If a directory for you does not exist on /c8scratch then you can create one for you. USER can be replace by the name of your choice. This queue is having 48 nodes configured; each node is having 12 cores cpu and 48GB memory. Head node IP of the cluster is 192.168.1.209 (C9-cluster is a 48 nodes parallel cluster. Naming convention of compute nodes starts from compute-0-0 to compute-0-47. Note: Submitting serial job in C9 is deprecated. For C9-cluster work area is /c9scratch. /c9scratch is mounted on clpc00, cluster1 and head nodes of all clusters and all the compute nodes of c9-cluster. If a directory for you does not exist on /c9scratch then you can create one for you. This queue is having 48 nodes configured; each node is having 16 cores and 128GB memory. Intel Cluster Studio Version 2013 is installed in this cluster.